How do you demonstrate your love to someone? For me it is doing things that I think will make their life easier. I like to cook delicious things that I think the other person would really enjoy. Some people see giving money or gifts as a demonstration of their love, others feel that spending time with the person they love is how they show that they care. Recently I am discovering that just being present with the person that you love and thinking about how I can be of benefit right now to the person I am with, is what truly counts. We don’t need to ‘impress’ others or be someone we are not. We just need to be fully ourselves our BEST selves. That is the most valuable demonstration of GREAT LOVE. He suggests that it is important to understand your own primary language and then discover the primary language of your beloved. He says we don’t all automatically speak the same language when it comes to love. I adore being the receiver of demonstrations of love. For me it’s the simple exquisite ones – the perfectly innocent moment when a stray hair is delicately brushed off my face or at just the right time a strong gentle hand arrives and caresses the small of my back. It’s pure heaven. When I was younger I used to turn away a little embarrassed when I would see other people demonstrate love. Like a couple kissing, embracing or holding hands. Now every time I see a demonstration of love I get a HUGE smile on my face and think to myself “How lovely”!!!! I am certain that one of the best things about being human is that we get to experience the divine deliciousness of GREAT LOVE!!! As usual Love is following me everywhere I go!! This week’s photo is another extraordinary example. 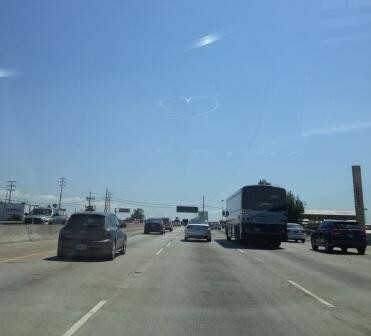 I was driving down the freeway in Los Angeles and I just “happened’ to look up in the sky and this is what I saw……..
Take a closer look ….. Amazing!!! 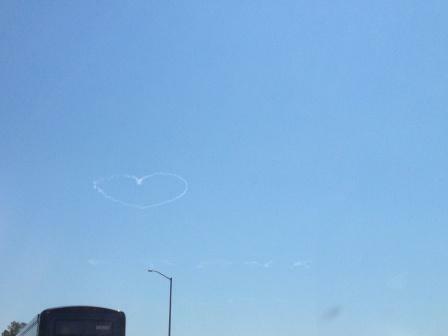 There was nothing else in the sky except this heart and some clouds. Life is just incredible!!! This entry was tagged Demonstrate Love, Gary Chapman, Great Love, Love, The 5 Love Languages. Bookmark the permalink.